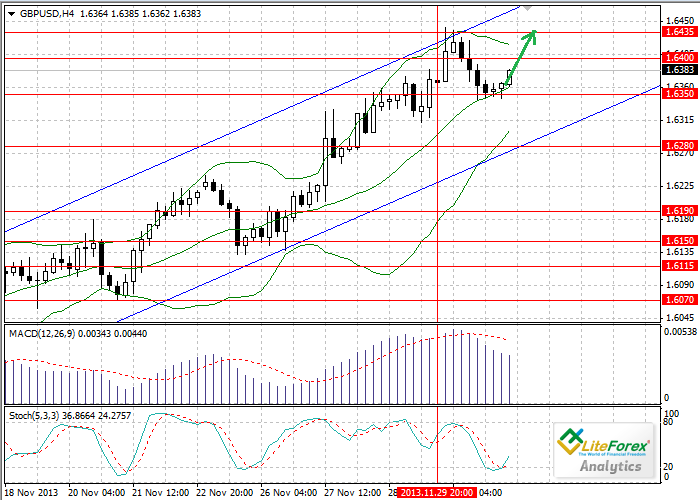 Following the rise last Friday, on Monday the currency pair GBP/USD experienced correction, reaching the level of 1.6350 (moving average line of “Bollinger bands” indicator). On Monday the data on business activity index in the UK manufacturing sector for November became known; he index increased to 58.4 points, demonstrating significant growth of optimism in the British industrial sector. The news supported the Pound and helped slow down the correction. Today, business activity index in the UK construction sector will be released. According to forecast, index will slightly decrease, but will still remain at a high level. In the current situation it makes sense to open long positions with profit taking at the level of 1.6435.